Witnesses to the eventual pairing of the Pacers and the Heats in the finals has made analysts who have said the two teams should not be expected to play the finals realize how difficult it is to imagine outcome of games or speculate on them. The Heats had defeated the Charlotte Bobcats and dispatched the Brooklyn Nets from the tournament. On the other hand, the Pacers had traveled path of uncertainty often made them to be considered as inconsistent. But what matters is their arrival at destination - the finals. It defeated eighth seeded Atlantic Hawks and zoomed past the Washington Wizards. It is a final many analyst view as capable of being won by either sides in the offensive. Some observers are analyzing why they think the Pacers will win and others' show why the Heats will win. Well, the first and second games will be played in Indianapolis on the 18 and 20 May respectively, and the two games are viewed as capable of rousing a powerful home support and advantage for the Pacers. 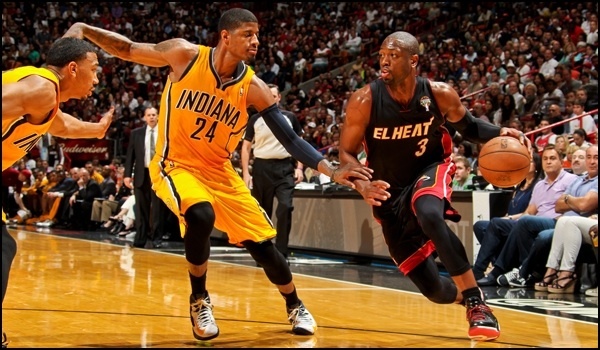 After the first two games in Indianapolis, the Heats will have its chance in Miami in the next two games. Although the Pacers line up are saying the first two games in Indianapolis meet their expectations, while observers say the Pacers should know that no one goes into the Heats abode to contain it and that whatever edge playing the first two games in Indianapolis will give the Pacers, such edge will be faced with possibility of being wiped out in Miami. Just as the Pacers think the first two games is an opportunity for them to have an edge before the Miami games, the same way basketball enthusiasts are saying whatever edge the Pacers gain can always be canceled by the Heats in Miami. What all these argument suggest is that at the end of the day, the best team will emerge winner of the Eastern Conference finals between the Pacers and the Heats. A young man in Brooklyn donning a Nets' hat said he would the Pacers to win. When asked why he likes the Pacers, he said because the Heats has too many good players in one team.